The Atlas adjoins our Chalet Arktic and their owners love of Tignes is evident from the huge picture windows and sun-terrace, from which to marvel at the fabulous views across the frozen lake, plus the whole Tignes valley and its surrounding peaks. The interior offers a stylish home-from-home in which to unwind, with a modern and light lounge/dining room and comfortable bedrooms, all with en suite bath or shower. The Atlas has its own sauna and terrace with outdoor hot-tub, for relaxation at the end of a great ski-day. The location is hard to beat, with the Chardonnet lift and piste just 150m away, and the amenities of Tignes-le-Lac just further 100m. In the other direction, the Toviere gondola connecting to Val d’Isère is only approximately 5 – 6 minutes walk. *Suite 5 sleeps a maximum of 3 people. We update Chalet Atlas's details often, but facilities do change. e.g. some extras listed by the supplier as "free" or included might only be for the first time you use them, or for one time per party, then charged for further use. If any specific feature is essential to your holiday, make sure you ask us to confirm the details of it before you book your holiday. This package holiday to Chalet Atlas in Tignes, France departs Sunday 15th March 2020, for a 7 night stay on a "catered chalet" board basis. A local tourist tax (Taxe de Sejour or Kurtaxe) is levied by many councils in European ski resorts. It varies by standard and type of accommodation and is age dependent, so not everyone is charged. It's not included in the basic price of your holiday and is usually paid locally. For reference, the average charged in winter 15/16 was between 50p and £2 per person, per night. Tignes lift pass price last reported as €294 (adult 6 day). 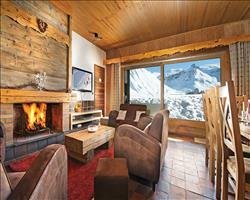 Ask for a quote when booking Chalet Atlas. 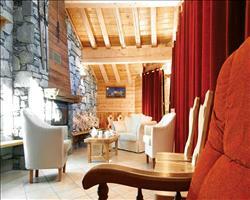 Chalet Anne-Marie Tignes France, Stansted to Chambéry 15th March. 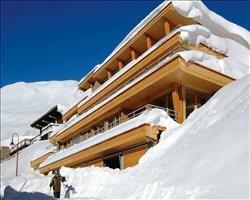 Chalet Chamois Tignes France, Stansted to Chambéry 15th March. Chalet Marilyn Tignes France, Stansted to Chambéry 15th March. 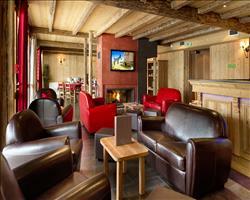 Chalet Aiglon Tignes France, Stansted to Chambéry 15th March. 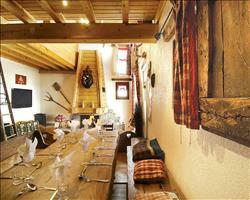 Chalet Caribou Tignes France, Stansted to Chambéry 15th March. 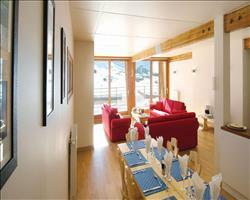 Chalet Iceberg Tignes France, Stansted to Chambéry 15th March. 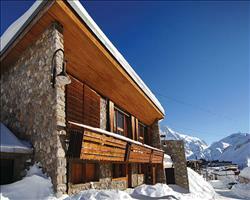 Chalet Corniche Tignes France, Stansted to Chambéry 15th March. A superb week! The young kids who looked after us were absolutely fabulous, they went above and beyond with the welcome they gave us and made sure we were comfortable. I was very happy with the chalet itself, it’s a lovely place, very modern and clean. They had a nice menu of different dishes, with great potion sizes. If you didn’t fancy what was on offer they’d make you something else. The chalet is located a 5-10 minute walk from the ski area, some people didn’t like that you had to go up and down a bit of a hill, but I was in snowboard boots so it was fine. Hadn’t been to Tignes before, the whole thing was booked last minute four days before I set off – but I’d definitely look at going to Tignes early in the season next year. "Near the lift, terrific view of lake from sun terrace"
With unbelievable views over the lake from the sun terrace, a sauna and an outdoor hot tub, you’ll have no problem relaxing off the slopes in the Atlas. Getting to the piste in the morning is a synch too, with the Chardonnet chairlift only 150 metres away. The wood panelled walls and open fire place give the chalet a homely feel- watching the snow fall on the frozen lake through the floor to ceiling windows is another great way to unwind.